Beside releasing the ZEN X-Fi3 which is another attempt by Creative to compete with iPod Nano, Creative also released 4 new gaming headsets are dessigned for PC, Mac and Console. It seems that Creative will be targeting the following markets, the gaming market especially PC and gaming consoles such as Xbox 360 and PS3. SINGAPORE – 1 September 2011 – Creative Technology Ltd today announced that it will unveil the next generation of Sound Blaster® gaming headsets for Xbox 360, Playstation 3, PC and Mac at 2011 IFA Berlin, at the Creative stand 111, Hall 17, Messe Berlin. 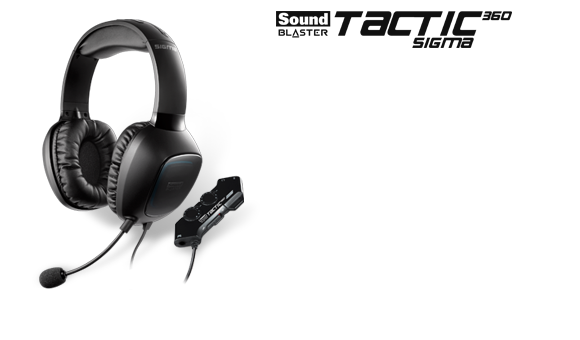 Sound Blaster Tactic360 Sigma Gaming Headset – Designed for Xbox 360Designed around the award-winning Sound Blaster Tactic3D Sigma gaming headset, the Sound Blaster Tactic360 Sigma features a sturdy steel core headband design with massively powerful 50 mm audio drivers. Its powered headset amplifier with separate voice and game audio controls deliver an exhilarating gaming experience on the Xbox 360. Sound Blaster Tactic360 ION Gaming Headset – Designed for Xbox 360With its durable, lightweight design and powerful 40 mm audio drivers, the Sound Blaster Tactic360 ION Gaming Headset includes a powered headset amplifier with separate voice and game audio controls to ensure pulse-racing gaming audio at the great price of only US$49.99. Sound Blaster Tactic3D Wrath Wireless Special Edition Gaming Headset – Designed for PC and MacThe Sound Blaster Tactic3D Wrath Wireless Gaming Headset delivers a powerful PC and Mac gaming audio experience with massive 50mm drivers and a killer design featuring red illuminated ear cups. The included software enables users to dramatically improve their audio playback quality and experience with THX TruStudio Pro™, a suite of audio enhancements developed by the collaborative expertise of Creative and THX audio engineers. Engineered for professional-grade gaming, the Sound Blaster Tactic3D Wrath features a steel-core headband, plush ear cups, rechargeable lithium battery, and a detachable microphone. In separate press releases issued this week, Creative announced the availability of the Sound Blaster Tactic3D Omega wireless gaming headset. Sound Blaster Tactic3D Omega Wireless Gaming Headset – Designed for Xbox 360, Playstation 3, PC and MacThe Sound Blaster Tactic3D Omega wireless gaming headset connects wirelessly to an Xbox 360, PlayStation 3, PC or Mac, and delivers phenomenal audio quality via massively powerful FullSpectrum™ 50mm drivers for a completely immersive gaming experience. The Sound Blaster Tactic3D Omega also features a detachable noise-canceling microphone for crystal-clear voice communications. With the included software, PC and Mac gamers can experience THX TruStudio Pro audio technology to customize their own gaming audio settings and profile. The wireless transmitter connects easily via standard USB or Aux-In. More information about the new Sound Blaster gaming headsets will be posted in coming weeks to soundblaster.com. site, how could i subscribe for a weblog site? The account aided me a applicable deal. utilizing? I'm experiencing some minor security issues with my latest website and I'd like to find something more safeguarded. Do you have any solutions? advice. Maybe you could write next articles referring to this article. I desire to read even more things about it!